I am writing this series as I go along with planning two Bachelorette weekends but first publishing more juicy details after the Bachelorette parties have taken place. Otherwise the brides-to-be will be sneaky and read my posts to find out more about their own 🌝. Let me start out by saying that this has been much more work than I thought it would be – but it’s so worth it because it’s so much fun 😂! 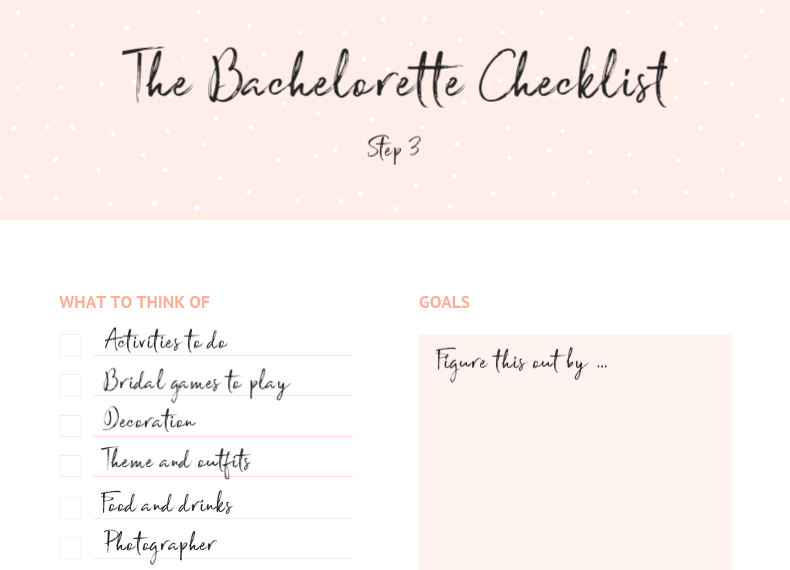 Since this has been the first time that I was in charge of planning a Bachelorette party, I honestly had so many thoughts just floating around in my head. It was a messy couple of weeks in the beginning of putting together all those thoughts on how to approach this whole thing but let’s face it – I. LOVED. IT. 😂 Because I’m an organizational freak that loves to bring order to messes and make everything come together perfectly 😇😂. But since not everybody feels this way, I figured I’d share a lot of helpful and inspirational information to help some of you guys and make this whole thing easier 🥳. Keep in mind, this is the first post of the Bachelorette Talk series, so we’ll start out general and circle in on the details while we move along in the planning process. 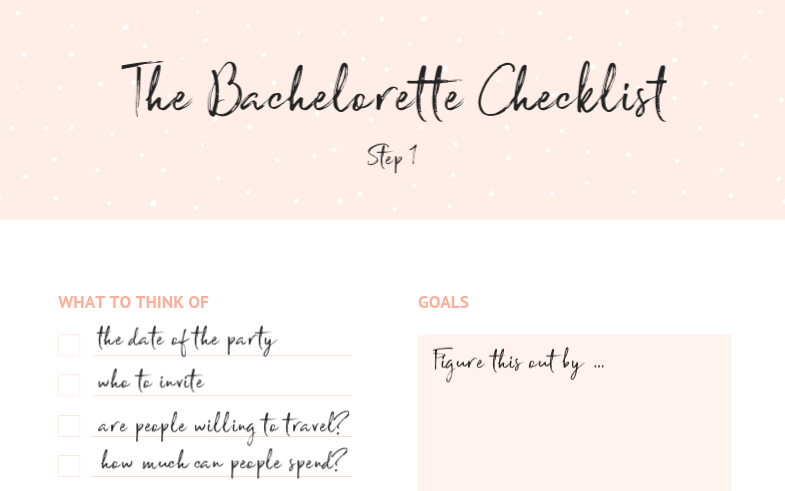 Step 1 of the Bachelorette Checklist revolves all around setting the base. You wanna start out by setting the date for the Bachelorette party. Then you should be asking the bride-to-be who she would like you to invite, since it’s her Bachelorette after all and you may not know everybody she would like to participate. The next thing you should clarify is whether or not the invitees are willing to travel somewhere for the Bachelorette weekend and how much money they are able to spend for it. After having roughly set the budget, you can then move on to Step 2. Step 2 involves deciding on what city to host the Bachelorette weekend in – whether that is in the bride’s hometown or somewhere abroad. Accordingly, you need to think about accommodation and transportation, which will depend on where the Bachelorette weekend will take place. 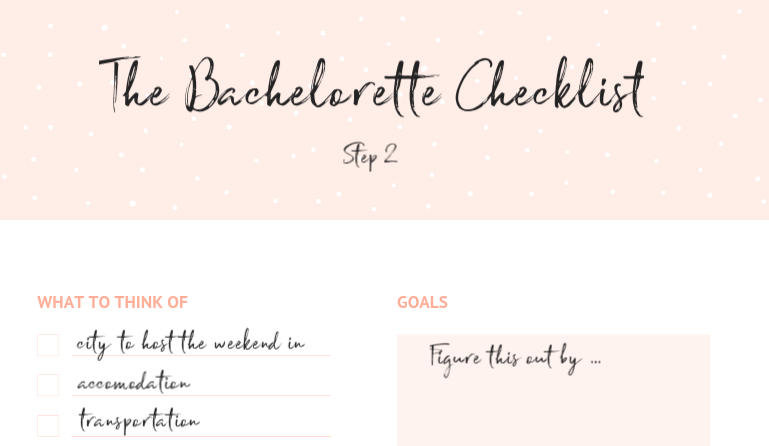 Step 3 of the Bachelorette Checklist involves all the fun stuff. You get to plan what activities should be done the whole weekend and what games to play with the bride. You should decide which decor you wanna go for and plan the theme and outfits accordingly. The next thing you should think about is food and drinks – if you’re going to surprise the bride at home, what should be on the table to eat and drink. It’s the small details that make everything come together perfectly, trust me. And lastly, I personally think you should hire a photographer that will capture the Bachelorette craziness. Since many will probably not remember a whole lot anyway, it’s nice to have some photos for memories! As you can see, there is a lot to think about and there’s a few collaborative softwares that can make it a lot easier to keep an overview of this, which you can read more about it in my next post. I hope you enjoyed this post or found it helpful.